Wine starts in the vineyard, there’s no real surprise there, but how does that vineyard get started? In the old world most vineyards have been in place for decades, if not centuries so choice of location for a new vineyard is rarely a concern. There just aren’t a lot of new vineyards being planted. In the Americas and Australia where the wine industry is booming, thousands of new vineyards are planted every year. There’s one critical factor that should be considered when someone decides to plant a vineyard and sadly, it’s ignored far too often, to the vineyard owner’s eternal regret. If the location is fixed, choose a grape type that will produce great wines in that soil and with that environment. Some of the choices of wine types that vineyard owners plant are baffling. Would you put a citrus farm in Alaska? I know, let’s plant a cornfield on top of the highest peaks in the Sierra Nevada. How about an oyster farm in the Nevada desert? That’s the equivalent of planting the wrong grapes in unsuitable locations. It seems every new wine region wanted to emulate Napa Valley’s success, the first region to crack the stranglehold that French wine had on the high end US market. So appealing is the urge to become the next Napa Valley, that many farmers invariably plant the same type of grapes ignoring the fact that the growing conditions have nothing in common with Napa. If you want to produce exceptional wine grapes, pay attention to points 1 through 7. If you want to produce exceptional wine grapes and have a prayer of staying in business, pay attention to point 1 though 8. Ignoring point 8 only proves the adage that the only way to make a small fortune in the wine industry is to start with a large one…a very…very large one. Having an ideal site than cannot be reached or is too expensive won’t yield phenomenal wine…just a bankrupt vineyard. According to UC Davis, it costs about $12.5K to establish one acre of vines assuming water is readily available and that doesn’t include the cost of the land – hardly the change that can be found in the cushions of your couch if you are planting a large vineyard. What’s a large vineyard? I’m glad you asked (yeah, I know you didn’t actually ask but I couldn’t come up with a better segue so humor me). The San Bernabe Vineyard in Monterey County is believed to be the third largest vineyard in the world (the damn Europeans took the title back several years ago). It’s 4,500 acres or just over 7 square miles and grows 21 different varieties of grapes as of year end 2013. By the way, the subject of vineyards can’t come up without also discussing the mystical concept of “terroir”, a French term that translates to “dirt” in French but in reality, it has no exact English translation because it has come to mean a confluence of many things in the vineyard that influence the taste of wine. I’m sure the French came up with just to stump Americans. They’re probably laughing about it right now. One of the worlds foremost experts on wine, Jancis Robinson, describes it as, “the total natural environment for any viticulture site”. While that is a good explanation of the natural world in which the vine grows, terroir means nothing if it’s not expressed in the character of the wine. The same list that dictated what type of grapes will grow in an area also dictates the ability of the wine to express it’s terroir. Terroir can give well made wines a distinctive character. For instance, many of the wines from the higher vineyards in the Stag’s Leap area of Napa Valley have a slight peppery aroma and flavor. Many believe this has to do with the area’s proximity to an ancient volcano. 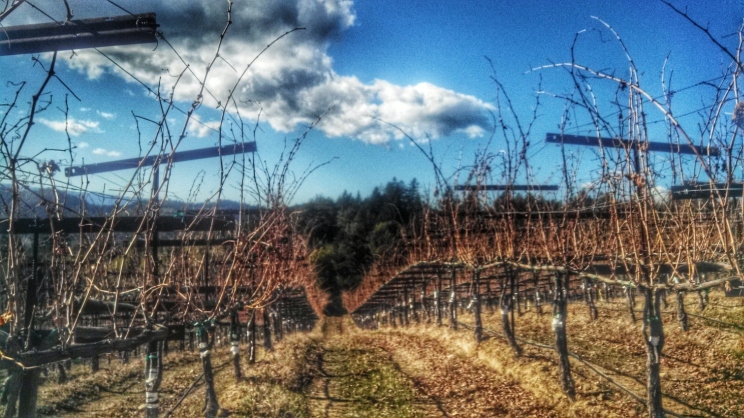 Whether it’s the minerals in its coarse soils, the sun’s exposure or the way the soil drains water in the winter, the wines are some of the most distinctive in Napa. The problem with terroir is that it’s very elusive to identify for all but the most experienced wine authorities. Just because a wine has a unique flavor doesn’t mean that it’s expressing its terroir. More often than not, what is thought of as terroir is just the hand of the winemaker influencing the fruit. To truly experience terroir in a wine, that wine can’t be made up of grapes from various regions. By definition, terroir is an expression of a unique region and all of its natural components. Blends can’t reproduce that. Even grapes from within a single vineyard can express their terroir differently, particularly if there is a heavier slope where the sun and wind exposure varies from higher elevations. Soil also can vary within a vineyard as erosion washes different types of soil down a slope. If you are looking for a wine that has the best chance of expressing its terroir, look for wines from boutique wineries that are designated as a single Varietal and come from a single vineyard. Some wineries will go so far as to designate a single block within a vineyard and create wines from just those vines because the expression of the terroir in the wine varies, depending on where in the vineyard the vines were located. To understand vines is to understand the start of the journey that wine takes. Call it location, vineyard or terroir, where the grape vines are planted is the start of the process that ends up in our glass. Great post, I now have a better understanding of terroir and the complexities of establishing a vineyard.